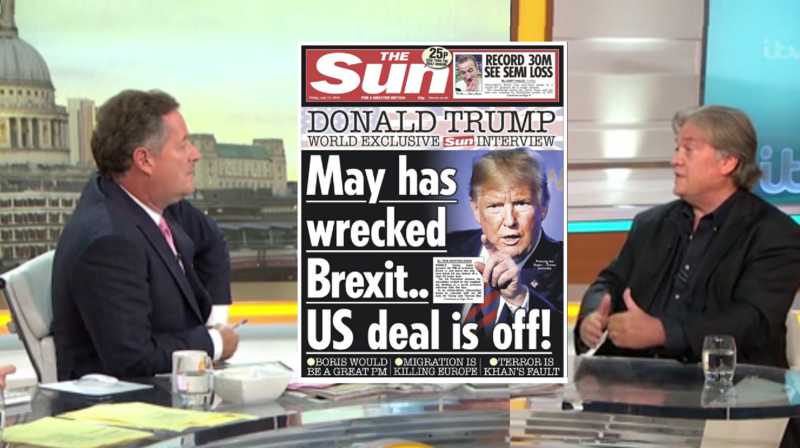 In an exclusive interview on Mr Piers Morgan’s show Good Morning Britain, the former chief strategist of the White House, Mr Steve Bannon, was therefore asked what he made of Mr Trump’s comments about the upcoming Brexit deal between the UK and the EU and about his interview with the British tabloid The Sun in which he repeated those words. YOUR NEWS CONFERENCE WAS GREAT! GO FOR EVEN GREATER! h t t p s: // w w w. you t u b e. com/watch?v=8 m AL 2 N q 9 q SQ here the two answer questions and the news if basically from those two..YET HOW THE MEDIA reports ..no wonder the world is a mess /media is not news media is listed as enterainment/ the video is from those two answering Questions before the media . the interview was not controlled by govs that also pay the media in each country to edit part and play parts for entertainment .. but not this vid interviews.